When your smile is left incomplete because of injury or disease, enjoying all of life’s little pleasures to the fullest can become much more difficult. At Pierson Dental, our team offers multiple worthwhile reconstructive services that can help you regain the strong, attractive teeth you deserve, and state-of-the-art dental implants are at the top of the list. Why are dental implants so successful? The answer lies in their structure – unlike other similar treatment options, dental implants successfully replicate the entire natural tooth, which means there is a new tooth root in place to stimulate your jawbone and preserve oral health. This results in a longer-lasting “tooth” that precisely matches the others while providing the same level of necessary oral function. Better yet, with the help of an in-house periodontist, Dr. Melvin Pierson provides every step of this transformative procedure right here in-house for maximum convenience and comfort! If you’re ready to enjoy your smile again, please give our Sicklerville, NJ office a call. The dental implant process requires multiple steps and appointments, starting with an initial consultation. After Dr. Pierson has determined that you’re a strong candidate for the service, it will be time to surgically place the implants themselves within the jawbone so that they can serve as “roots” that stimulate and preserve healthy tissue. Instead of sending you on a time-consuming trip to an outside specialist for this procedure, our talented in-house periodontist will come to you. Then, over a period of healing, the natural bone and tissue will gradually form around the implant(s), creating an enduring foundation that will successfully support replacement teeth. Traditionally, patients had to put up with having to wait several months until the mouth successfully healed from surgical implant placement before a new crown could be attached to complete their smile. Thankfully, technological advancements in the field of dentistry have made it possible in many cases for our Sicklerville team to both place the implant and a temporary crown right away after the natural tooth has been removed. During your first appointment, we will begin by removing the tooth and reshaping the extraction site so that it will be capable of successfully receiving a new implant. 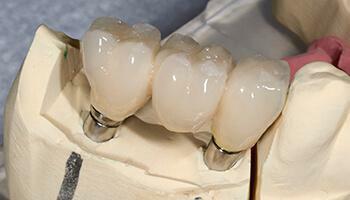 After attaching an extension to the implant, a temporary dental crown will be created and securely placed over it. 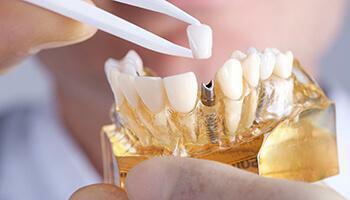 Our team will make any necessary adjustments to ensure that the patient’s new “tooth” is comfortable and functional. Then, the second phase of treatment occurs at a separate appointment when it’s time for the temporary crown to be replaced with a new, permanent version. You’ll never have to be without a full, confident smile! In addition to dental crowns, implant-retained prosthetics are also available as a worthwhile dental implant restoration. These devices are designed to cover multiple implants at once, which can be more cost-effective for patients in need. They can be fixed (permanent) or removable in nature, depending on the patient’s oral health and personal preference.